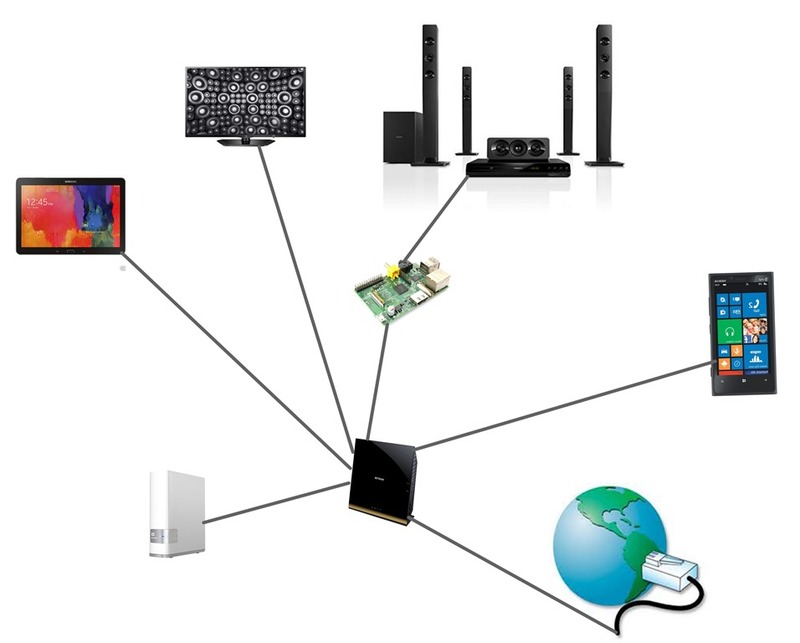 This post explains how different devices at my home connected via Wi-Fi and provide an easy way of streaming media contents. In this setup I created the playlists in one location (NAS) and all other devices can consume it. All my devices are connected to Netgear’s gigabit router. Earlier I had a 10/100 Netgear router and I replaced it with 10/100/1000 router. If you are planning for a streaming network at home its worth investing in a very good gigabit router. The integral component of my streaming network is the 4TB WD My Cloud. It host twonky DLNA server and iTunes server, any DLNA complaint devices can connect to it and stream audio or video. Some devices at my home is not DLNA complaint, like docking station and Home theatre. That’s where Raspberry PI will be helpful. I knew about Raspberry Pi since it launched but never used it until recently. I decided to use Raspberry Pi to make my non DLNA devices to play media from my NAS. There are so many tutorials available in the internet to setup a Raspberry Pi, using noobs installer and using Raspbian image, I use Raspbian image to setup. Next is setting up my Pi to play media from a DLNA server, Stephen Phillips has a very good post explaining how to do it. Follow the steps and you will have a device that can connect to any non DLNA device to play media from a server. I then connect the Pi’s audio out to my Home theatre and could play audio from the NAS. Without raspberry pi I have to switch on my TV when ever I want to play audio, with this setup my TV can be switched off when I am listening to music, also it saves energy. I can use my Android Tab as a remote to paly media using BubbleUPnP (paid and free) or from my Lumia 920 using AV Remote (paid and trial available) or a free app called myMediaHub. You can use any similar apps you want. WD MyCloud comes with twonky DLNA server. So it can stream to any DLNA client. I then installed gmrenderer to Raspberry pi. WD MyCloud and Raspberry pi is connected to my Wifi router. Not sure whether I answered your question, let me know if you need any more details. i would like that my ‘raspbian’ could download directly to mycloud disk. Thats why i’ve read they have mounted that disk, but it doesn’t succeed here. Anyway how to use gmrenderer ? The advantage of this method is you can control the music play via your smart phone.